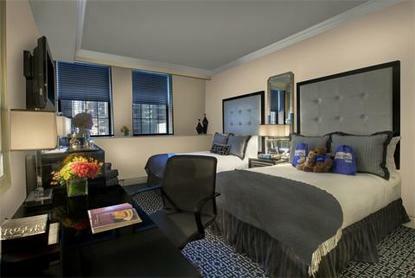 Let us show you how it feels to be pampered in New York City. This New York City Times Square hotel, a stylish four diamond boutique hotel, features 200 uniquely styled guestrooms and suites that are sinfully spacious by New York City standards. Making its home in the beautifully renovated, historic Leavitt Building just steps away from Times Square, The Muse Hotel draws guests in past the arched, limestone-and-brick fa e, and invites them to daydream on the whimsical, overstuffed sofas and midnight blue velvet rolled-arm lounge chairs in the lobby. Such daydreams are further inspired by the nine muses in the commissioned mural on the vaulted ceiling above and then energized even more by features like the adjacent District restaurant and the Mini Bar lounge, along with the upscale amenities and personal service expected of a Kimpton Hotel. Our 1350 square feet of meeting space also make the hotel the perfect location for your next meeting or conference. Or let our professional staff help you plan an unforgettable event around your wedding or wedding reception at The Muse. And you don't have to leave your furry friend behind - The Muse Hotel offers special pet friendly packages and services. Welcome and refreshing, The Muse Hotel is a calm haven amidst the non-stop activity of Times Square and midtown Manhattan. An early departure fee in an amount up to one night's room and tax may apply. The Muse New York is a non-smoking hotel. Our environmental program, Kimpton Hotels EarthCare, supports a sustainable world by using non-intrusive, high quality, eco-friendly products and services, including In-Room recycling bins, non-toxic cleaners, organic honor bar items and water/energy efficient measures. Kimpton Hotels EarthCare products and practices are based on California Environmental Protection Agency (EPA) Green Lodging Guidelines.